Google has designed a new set of emojis depicting professional women to highlight "the diversity of women's careers" and combat sexism. The 13 proposed emojis -- unveiled on Tuesday -- show women in a range of jobs, including health care, science, education, farming and construction. A further 13 corresponding emojis will show men in the same roles. Google's (GOOGL) goal is to have these emojis in regular use on smartphones and computers by the end of the year to "empower girls everywhere," according to its proposal. As it stands now, there are over 1,000 standardized emojis used globally that depict everything from ice cream to dragons to police cars. However the current emoji selection feels implicitly sexist, showing men running and policing while women dance and cut their hair. Google hopes emojis depicting working women will soon be used on smartphones and computers around the world. "Given the fact that women are the most frequent emoji users, and that they span a wide professional spectrum not yet reflected in current emoji, we want to help address this pressing matter of equality," Google said in its proposal. It's a fine gesture, but there is still a long way to go to put women on equal footing in the workplace. Women in the U.S. make about 79 cents for every dollar men earn, according to the latest data from the National Committee on Pay Equity. The gender pay gap has been closing since the early 60s, but change has been slow. A recent McKinsey Global Institute report estimates that the U.S. could grow the economy by an extra $2.1 trillion in gross domestic product over the next decade if the private sector, policy makers and non-profits make more of an effort to narrow the gender gap at work. Women constitute about 51% of the U.S. adult population, but they make up just 46% of the workforce. Google submitted its proposal to the Unicode Consortium, which is a non-profit organization dedicated to creating standardized emojis and text characters that are used across different platforms by the likes of Apple (AAPL), Microsoft (MSFT), Facebook (FB) and IBM (IBM). One author of the Google submission -- Mark Davis -- is also the president and co-founder of the Unicode Consortium, which could make it more likely that the proposal will be approved. There's been growing support for the introduction of more inclusive emojis over the past few months. Even the United States First Lady Michelle Obama has weighed in on the issue, voicing her support for a new "girl studying emoji" in a tweet in March. 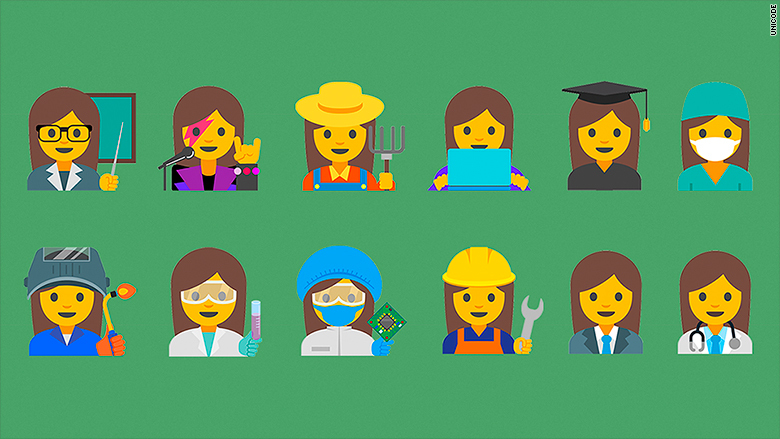 Google chose the professions for its new emojis based on a review of workforce data from the U.S. Bureau of Labor Statistics and the U.N.'s International Labour Organization, among other agencies.